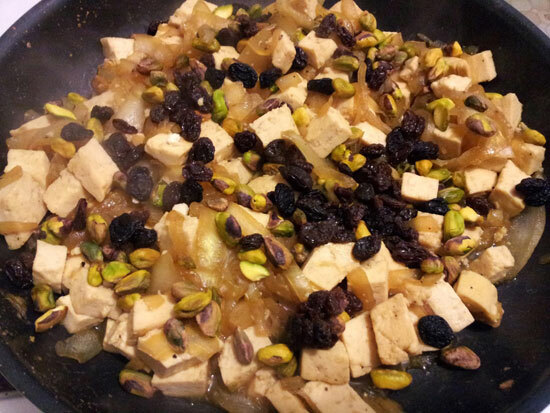 This fun guest post is a Persianized version of a Mark Bittman tofu dish recipe. Persianized by Dan Silverstein, that is, an artist friend of mine who is gregarious, quirky, a man of action, and a landscape designer and gardener par excellence. Dan studied landscape design at The New York Botanical Garden and completed the horticulture program at the Brooklyn Botanic Garden. If you’re in Brooklyn or Manhattan and need a landscape artist, Dan is your man. See, it even rhymes. And If you would like a Persianized tofu dish, well, Dan is, once again, your man. Without further ado, let’s read the recipe in Dan’s own words. Hi everyone! 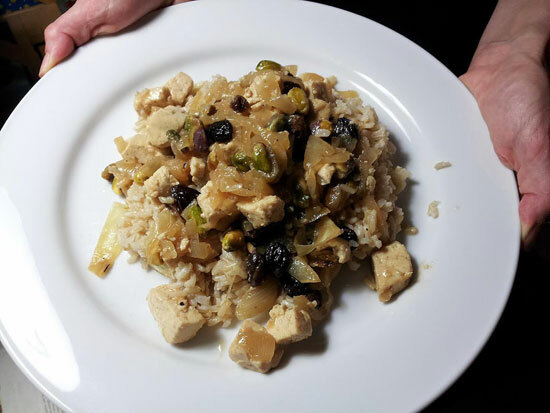 This is my favorite quick tofu dish. It’s a Mark Bittman recipe that I’ve “Persianized” by adding raisins and pistachios. 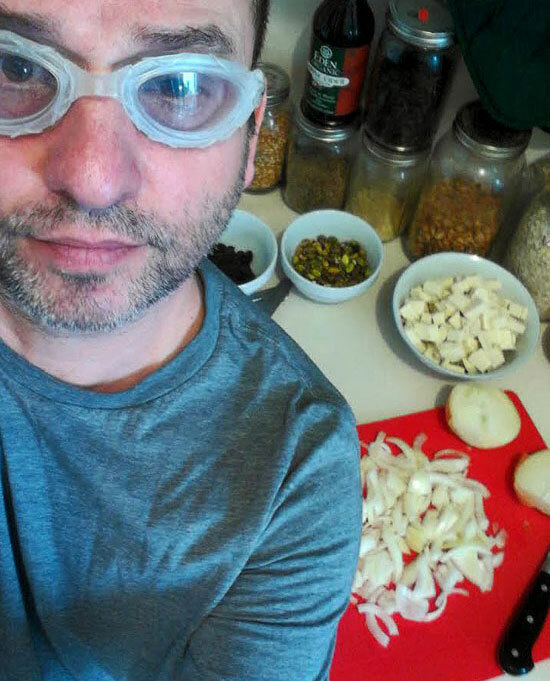 Slice up two onions and set aside. Swim goggles are a great way to keep the tears away. It also gets a few laughs when you have guests over. Add 2 tablespoons of water and 1/3 cup sugar to a non-stick pan. Heat up (medium heat) for a minute or two, mix around and allow to bubble. If you’re lucky the mixture will turn a light golden brown as per Bittman’s recipe. Add the fish or soy sauce (I have always made this dish with fish sauce but with raisins and pistachios it will taste better if made with soy sauce) to the mixture and stir it around for about ten seconds. Turn heat low and add the onions and pepper. Sautee the onions for about ten minutes until nice and soft. Then add the tofu and simmer for about ten minutes, turning tofu a few times so that it becomes glazed and heated through. Stir in butter and lime juice. Add raisins and pistachios. At this point there should be some juices left in the pan. If not, add 1/4 cup and mix well. Taste. Add more pepper or lime juice if you like. The important thing is to make sure that when all is cooked and the liquid bits have cooked down there needs to be some saucy liquid left so that the rice can become infused with the flavors. Adding the raisins and pistachios increased the need for a bit more liquid than originally called for. Tasting during the process is important so that the dish isn’t too salty. 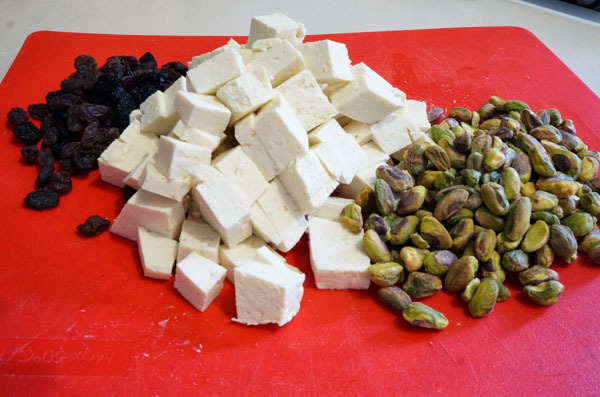 Persian style tofu is served! Eat immediately! Serve over rice and eat immediately! Thank you Dan for a quick, healthy and fun recipe! May you continue to beautify New York City one garden at a time.
. And you guys, don’t forget to keep in touch with me while I’m away via Facebook and Twitter. or Instagram. Miss you and I’m waiving hello as I drink a delicious sharbat ‘e albaloo all the way from Iran! 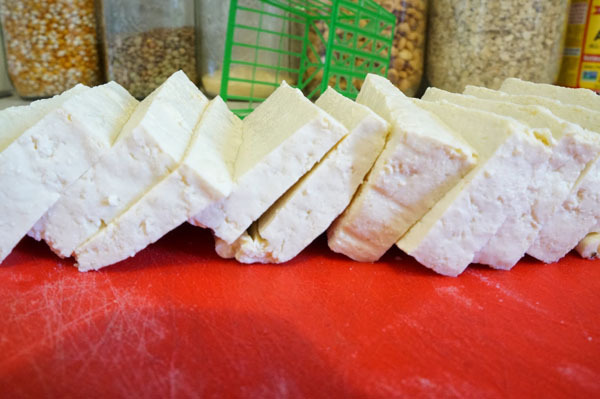 Love your very creative Persianized tofu Dan! Sounds delicious!! Looks like a great meatless dish!